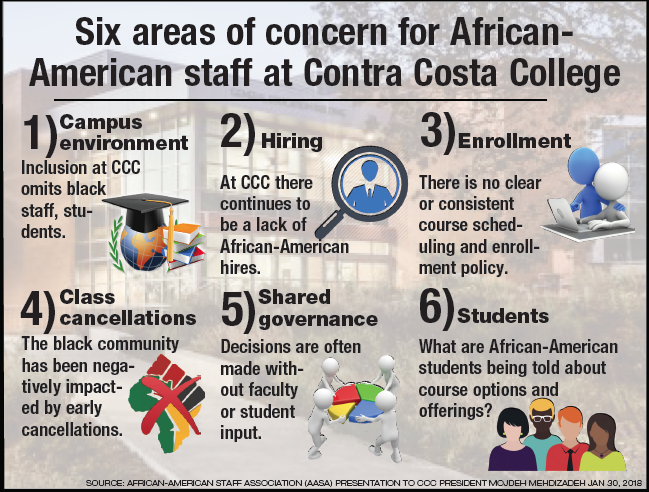 Concerns that the Contra Costa College community has become comfortable neglecting its students and staff of African descent by failing to support their programs, or hiring black faculty and staff, has reached a boiling point. The African-American Staff Association (AASA) at Contra Costa College gave a presentation on Jan. 30 to then-college president Mojdeh Mehdizadeh outlining six areas of concern in relation to African-American students and employees. The meeting of current and former AASA members addressed the hiring of African- Americans on campus, class cancellations, shared governance, campus environment, student concerns and enrollment. Shortly after the presentation, a Contra Costa Community College press release on Feb. 8 announced Mehdizadeh’s reassignment to the District Office in Martinez. Although concerns were raised to Mehdizadeh, who briefed Chancellor Fred Wood about the meeting, the trend of omitting students of African descent continued. In an April 2 campuswide email sent by Director of Marketing and Media Design Brandy Howard on behalf of Interim President Chui L. Tsang and Dean of Institutional Effectiveness and Equity Mayra Padilla with the subject line “A note on our inclusive community,” a call to action was given urging the campus community to rally behind Muslim students, DREAMers, LGBTQ individuals and women “during these especially trying moments” over the past year. Conspicuously absent was support for campus community members of African lineage who also face discrimination and challenges. In an attempt to thwart this continuing trend, the AASA invited Chancellor Wood to CCC to hear the complaints first-hand on April 11. Current faculty and staff, retired members of the AASA, the ASU president and a representative from the El Cerrito chapter of the NAACP attended the meeting. “We need Wood to step up and bring leadership from the top down because if it comes from the bottom up, it might not be pretty,” CCC counselor Andrea Phillips said. The AASA presented information stating there have been no African-American male counselors hired at CCC in the past 12 years. Furthermore, the association claims minimal hiring of science, technology, engineering and mathematics (STEM) instructors of African descent have been made, despite nationwide efforts to diversify the field. According to the district information management system Datamart, the number of African-Americans who hold positions at the various instructional levels at CCC has fallen in the past 10 years. Administrators have dropped from seven in 2008 to four in the fall of 2017. Tenured or tenure track African-American faculty have also fallen from 18 to 13 over the same time period. Three of the four previous CCC presidents were African-American and the upper-administrative positions of dean of students and dean of instruction have also shifted away from African-American leadership. During the presentation, attendees passed around the most recent 28-person new-hire list, including deans and upper-management, to show who filled the open positions. AASU President John Wade said some people on campus are part-timers who eventually want to become full time and have been passed over when applying for positions here. The association also used examples to demonstrate how faculty and students of African descent have been adversely impacted by early class cancellations. The use of early fill rates to determine what classes should be canceled was also brought into question. At CCC, African-American students make up the second largest student demographic at over 16 percent, or 1,161 students, according to the California community colleges Chancellor’s Office information management system, Datamart. Hispanic students make up 44 percent of the student body, with white/non-Hispanic rounding out the three largest demographics at 11 percent. Ampim said departments chaired by faculty of African descent have a higher standard to meet. His classes are set at a 40-student cap, while some STEM classes have a lower standard to meet. The association agrees, the fill rate process is flawed because a STEM class with a cap of 30 students and 24 students enrolled places the fill rate at 80 percent. However, an African- American studies class with those same 24 students and a cap of 40 may be canceled because its 60 percent fill rate is labeled poor. The association contends the flawed procedure led to a number of AFRAM class cancellations before the semester began, while other classes were allowed to continue. Following early class cancellations, more than 1,000 students enrolled during the final week of summer before fall classes began. Even while working to address an improper enrollment strategy, getting the college website to properly list the classes has also been an uphill battle. “You almost have to be a diligent researcher to find the AFRAM classes,” Ampim said. Prospective students looking for African- American studies classes must search under the special programs tab when enrolling. METAS and Puente classes can be cross-listed in different sections, but for African-American studies, administrators say software constraints limit the ability to promote those classes. The AASA also contends that decisions across the campus are made without faculty or student input. “Shared governance is a wonderful idea, but it’s not here now,” Ampim said. In the past there was shared governance because even though management could make autonomous decisions, why would they make decisions that would alienate their faculty? Now, he said, it doesn’t seem to matter very much. According to CCC Vice President Ken Sherwood, the shared governance process by which decisions are made through committee rather than by the college president is enacted vastly different here than at other campuses. Sherwood said the definition under the law is participatory governance, meaning everybody gets a say, but it doesn’t mean that everybody has the ultimate decision. The way it works under the law is, everything is a recommendation to the president and then the president decides. “It’s really different to have a president say ‘I’m not going to impose my will on this college,’” he said.